The first Fonepad premiered in 2013, nearly a year after the game-changing Nexus 7, which Asus made for Google. The Taiwanese got another contract to work on an upgrade and they did well to keep the momentum. Padfones, Fonepads, Memo Pads and Zenfones were soon to join the Transformers in a lineup that's entirely indifferent to phones but offers an impressive variety of phablets and tablets. The downside is it can get confusing. The original was simply called the Asus Fonepad. The Fonepad 7 succeeded it, followed by the Fonepad 7 (2014). At that point, Asus ran out of fresh naming ideas and the next generation has the model number in the official brand name. As a result, we're reviewing something a Fonepad 7 FE375CXG. OK, a quick what's what in the Asus portfolio. Transformers are 10" convertible tablets with a detachable keyboard. Zenfones are phablets and Padfones are hybrids: a _phone_ and a docking station with a tablet-sized screen and battery. And finally, the compact tablets. These come in two flavors: Memo Pads are the household version of the Nexus, compact tablets with no voice call support. The Fonepads are the ones you can make network calls on. One of the latest additions to the series, the Fonepad 7 FE375CXG is a dual-SIM compact tablet with expandable memory, front and rear cameras and stereo speakers. It's powered by an Intel chip - these are getting more powerful with each generation and yet manage to stay affordable. The one inside the Fonepad 7 is 22nm 64-bit chipset. The Fonepad 7 FE375CXG appears bulky but it's not much thicker or heavier than most of its natural rivals. If you're after a tablet you can make calls on, Samsung's Galaxy Tabs are perhaps the most likely alternative. But if it has to have dual-SIM support, the competition is nearly non-existent. The Fonepad series are meant for the developing markets but should be easy to get via local retailers or official Asus distributors in Europe. Affordable, reasonably powered and capable of making calls on two SIM cards, the latest generation Fonepad 7 can get a lot of people interested. The Fonepad 7 FE375CXG came in a standard retail box, which contains the device, an A/C adapter and a microUSB cable. Pretty standard equipment for a compact tablet, so no worries but headphones would've definitely made sense in a tablet capable of making and receiving calls. The Fonepad 7 FE375CXG looks a lot like previous models in the series and isn't much different from the Memo Pads either. The choice of paint jobs is pretty similar too, Gold replacing the blue option of the previous generation. What's instantly noticeable about the Fonepad 7 FE375CXG are the front stereo speakers. Those have inevitably added a bit of space top and bottom of the screen. The tablet is still reasonably compact, but the screen to surface ratio is hardly spectacular. At 194.3 x 108.9 x 9.8mm, the Fonepad 7 weighs a hefty 300g. The footprint is acceptable, especially considering it's a very affordable device. After all, it was never meant to fit in pockets so the added thickness and weight won't matter in a bag or backpack. The tablet is made of mostly matte plastic, a dark brushed ASUS logo looking good on white over at the back. A slim silver frame around the front goes well with the silver grilles of the front stereo speakers. The rear looks nice in white, no gloss whatsoever but not enough grip either. It's not a big deal in a compact and overall comfortable to hold seven-incher. 299g of weight are perfectly acceptable and being a centimeter thick, the device can be held firmly in single and double-handed use. The Asus Fonepad 7 FE375CXG is an easy one to slip in a bag and carry around without hassle. Compact 7" tablets are the outdoor type and dual-SIM support means this particular one doesn't belong in the living room. Those calls are always better taken with headphones, of course. The front of the Asus Fonepad 7 FE375CXG features a pair of stereo speakers either side of a 7" HD display. The top speaker doubles as an earpiece, flanked by a couple of sensors and the VGA front cam. There are no keys below the display, just the second speaker grille and an ASUS logo. The Fonepad 7 only has two physical controls - the volume rocker and the power/lock key - placed almost at the back of the right-hand side. They are big enough and the location actually makes sense when you're simply holding the device. If you need to press them all at once or in combination (while snapping screenshots) there's a greater risk of letting the device slip out of your hands. On the left there is a huge plastic cap covering the two micro-SIM compartments and the microSD slot. All three of them are hot-swappable. The microUSB port is at the top of the Fonepad 7, while 3.5mm audio jack and the microphone are over at the bottom. The 2MP fixed-focus camera lens is the only thing of note at the back. The Asus Fonepad 7 FE375CXG packs a 7" IPS display of 1280 x 800px resolution for a pretty average 216ppi. We've grabbed a picture of the display matrix under a microscope and it revealed a standard RGB arrangement, not that we expected something else. In our display test, the Fonepad 7 FE375CXG posted surprisingly good contrast numbers for its class. Blacks were fairly deep at 50% brightness, and retained their low level at 100%. The whites' illumination was low at both levels, however, but that still resulted in adequate contrast numbers. Unfortunately, the good contrast was spoiled by the highly reflective screen of the Fonepad 7 FE375CXG. With a sunlight ratio of just below 1.2, the screen of the Fonepad 7 is near illegible outdoors even at maximum screen brightness. It also tends to get easily smudged, which doesn't help either. The highly reflective screen can potentially be an issue even indoors. Screen looks pretty washed out under artificial light as well. You won't get to enjoy the otherwise excellent contrast even in a moderately lit home or office. Disappointing indeed. The battery in the Fonepad 7 FE375CXG is the same 3950mAh unit as in the previous Fonepad models and Memo Pad 7 slates. The Fonepad 7 showed excellent longevity in the web browsing routine lasting 12 hours and it managed to last 17 hours and then some on 3G talks. Video playback turned out more taxing on the battery, but a hair short of 10 hours is a very respectable score nonetheless. Unfortunately, the dual-SIM 3G standby was a real sucker on the battery juice - the Fonepad 7 wouldn't last a day on standby with a full battery. Then we popped out one SIM card and the Fonepad 7 managed to live for two and a half days on 3G standby. This is probably some issue with the software optimization as it is nowhere near the promised 316 hours. Hopefully Asus releases a fix soon. So, with just one SIM card the Fonepad 7 achieved a total endurance rating of 37 hours, which means you can count day and a half if you do an hour each of calling, web browsing and video playback daily. The dual-SIM (dual standby) Asus Fonepad 7 FE375CXG has quad-band GSM and 3G support. Download speeds can potentially go up to 42.2Mbps with upload of up to 5.76Mbps over a 3G network. There is also Wi-Fi 802.11 b/g/n with Wi-Fi hotspot, as well as Bluetooth 4.0 with A2DP. The device has an on-board GPS/GLONASS chip. The microUSB port has USB On-The-Go support, so you can plug USB flash drives and connect a mouse or keyboard. There's DLNA TV output and a dedicated app but no wired TV-out. The Fonepad 7 has pre-intalled apps too for quick file and media sharing, including pairing with a PC or laptop and quick exchange of files with simple drag and drop. There is no IR blaster and NFC support though. The Asus Fonepad 7 FE375CXG runs on Android 4.4.2 KitKat with a large range of customizations from Asus. The company has opted for a light overall look and the proprietary applications have a consistent interface. Check it out in the brief video below. Beyond the lockscreen is the Android homescreen with four customizable shortcuts docked at the bottom. Despite the ample space available, you cannot add more icons beyond these four, but there is folder support. There are preloaded Asus and Google folders, which contain a selection of applications from the respective companies - custom Asus apps in one, default Google apps in the other. Google Now is available everywhere with an upward swipe from the Home key. If you don't like the Zen launcher, you can always revert to Google's vanilla one. Asus Fonepad 7 FE375CXG is powered by the Intel Atom Z3530 chipset, which translates into a quad-core 1.3GHz 64-bit processor, PowerVR G6430 GPU and 1GB of RAM. We've seen this particular GPU in iPhone 5s, iPad mini 2 and mini 3 and it is indeed quite capable. Here is hoping the 1GB RAM would be enough to handle the common tasks and pressure. Let's check the Intel processor performance first. We ran the Geekbench 3 test and the Fonepad 7 FE375CXG finished last. This was to be expected though as its processor is clocked at 1.3GHz - lower than the 1.86GHz MeMO Pad 7 models, or the 2+ GHz Xperia Tablet Z3 Compact and Xiaomi Mi Pad 7.9. The Apple's dual-core Cyclone is an exception here, but we already knew it does outstandingly in every way. We continue the benchmarks with the latest AnTuTu 5, which also tests graphics and memory. 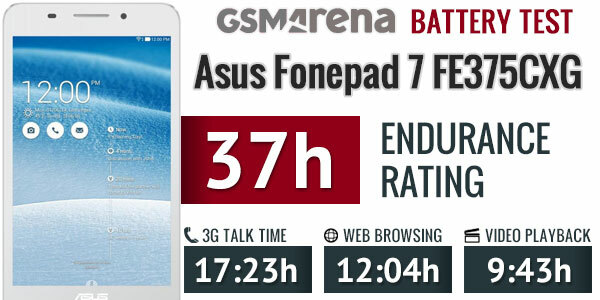 The Fonepad FE375CXG scored the same as the Asus MeMO Pad 7 ME176C, which runs on a faster processor and similar resolution. The newer MeMO Pad 7 ME572C does better because it offers not only faster CPU, but double the RAM. The BaseMark OS II test gauges not only the CPU, GPU and memory performance, but web and system as well. The Fonepad 7 fell to the bottom of our chart. The CPU single and multi-core breakdowns from the BaseMark OS II brought us to similar conclusions as the GeekBench 3 test - the Fonepad 7's processor is the least performing unless it is compared to a single Cortex-A7 core, which is weaker. The PowerVR G6430 GPU is probably what makes the Fonepad 7 worth buying - we've seen it doing great on the iPhone 5s, iPad mini 2 and mini 3, and we are sure it will run blazing fast on a sub-1080p resolution. Indeed the onscreen performance turned out great with the Asus Fonepad 7 being very close to the Xiaomi Mi Pad 7.9. Sure, the Nvidia Kepler GPU is way better, but it runs on a Retina resolution, which takes its tool. In the end of the day - a modern 3D game would run equally smooth on both devices. Doing the offscreen benchmarks, which run at 1080p resolution, shows the PowerVR G6430 is still quite capable of handling on its own. 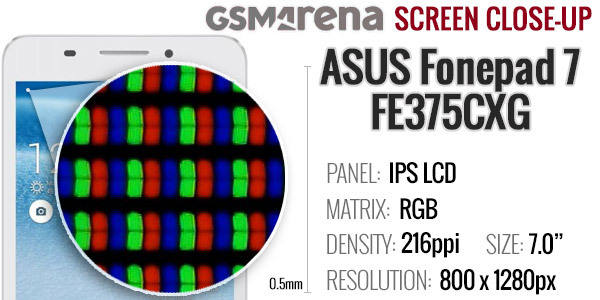 Asus Fonepad FE375CXG isn't acing benchmarks nor is providing a flagship performance. But it wasn't meant to be that kind of device. It handles well the Android OS, will do OK with some power-hungry productivity tasks and will surprise you when running a heavy-duty 3D games. For a device priced at about €180 or less, we are definitely fine with all of these. The dialer and the phonebook share a single app although there are two shortcuts. It uses a tabbed interface - recent with dialer on the first, the contact list on the second, followed by favorites, and groups. The dialer supports Smart dialing and works great - it's looking up both names and _phone_ numbers so you always find what you need. If both SIM cards are active you'll automatically get two green call keys under the dialer, one for each of the SIMs. The Fonepad 7 supports voice call recording and it can do it automatically on each call if you like. The Asus Fonepad 7 FE375CXG scored a Good mark on our loudspeaker tests, meaning you'll hardly miss any calls and notifications. Note that we've used the Music preset from the system-wide AudioWizard sound app. If you decide to leave it on Battery Saver mode, you'll get a really poor performance. The messaging section is business as usual. All SMS/MMS communication is organized into threads - each thread consists of all messages between you and one of your contacts. You can select multiple threads to mass-delete. Adding multimedia content is hassle free. If you both SIM slots are occupied and active, you'll get two SEND keys, one for each SIM card. The standard client has a clean simple white interface with your email folders on the left and your list of messages on the right. If you add more than one account and you get a combined view of all your emails from each accounts. The Email app can handle Exchange, POP or IMAP inboxes. The Gmail app is also onboard, with nice and clean interface but there is no option for unified inbox for your multiple accounts. We suspect everyone will be using Inbox soon though. Text input is done through ASUS keyboard, which looks a lot like Google's keyboard but with a different paintjob. On this screen the keys are comfortably large in both portrait and landscape mode. There is support for swipe typing, handwriting and Google voice input. The Asus Fonepad 7 FE375CXG comes with a custom Gallery app. It defaults to a view of your folders and the camera roll is highlighted over the top. The Gallery also supports events and people views, plus it can display images from various cloud services including ASUS, Omlet, Facebook, OneDrive, Google Drive, Google+ and Flickr. The available features when viewing a single image are pretty standard - set image as wallpaper/contact image, share it, delete it, enter edit mode or just get more info. You also get quick shortcuts for rotation and additional information. The Fonepad 7 FE375CXG video player is part of the Gallery, there isn't a stand-alone app. There are no premium features or particularly striking video decoder support. Its interface is very simple, too - just a playback scrubber and a play/pause button, alongside a sharing button at the top. It wasn't able to play anything but MP4 and MOV files, plus very few AVIs. DivX, Xvid, MKV, WMV are a no go, as is the AC3 audio codec. If you need a video player to open anything besides your camera roll videos, you'll have to opt for one in the Play Store. The Asus music player does decently in terms of functionality, covering all the basics. It has a large Now Playing window with prominent album art, and also has integrated bass boost and surround sound options, although both of those only work with headphones. An equalizer is also available with multiple presets and a single custom setting. The Asus FonePad 7 did nicely in our audio quality test, slightly surpassing its Memo Pad 7 sibling we recently tested. The tablet had perfectly clean output when connected to an active external amplifier and garnished it with high volume levels. It's loudness levels are among the better out there, even in the more demanding tablet league. Plugging in a pair of headphones does cause a fair amount of issues, though. 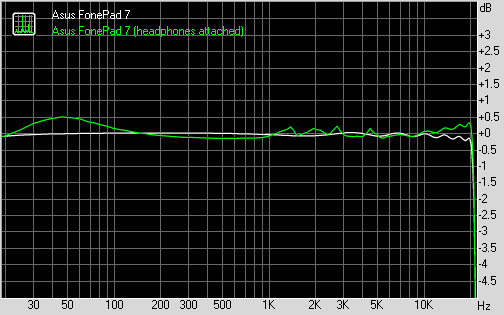 Volume levels plummet to below average levels, stereo crosstalk appears and so does intermodulation distortion. The frequency response is no longer perfect either, adding up to a rather mediocre performance in this second scenario. The camera mounted on the back of the Asus Fonepad 7 FE375CXG is capable of capturing 2MP (1600 x 1200px) stills and 720p videos. It features a combined interface which allows you to take either a still image shot or use the camcorder functionality via side-by-side buttons. As far as quality is concerned, the Asus Fonepad FE375CXG is just bad. Colors are washed out and the level of resolved detail is low even for this resolution. Looking at the images in full-res reveals an aggressive de-noise filter that results in an oil-painting effect that detracts from the level of detail even further. HDR mode tends to improve cameras with poor dynamic range, and that was the case with the Fonepad 7, but the image quality is still really poor. The Fonepad 7 is actually capable of shooting good panoramic shots at 4400x1100px in portrait and 4400x700px in landscape mode. The stitching is very good, as are the details and contrast. 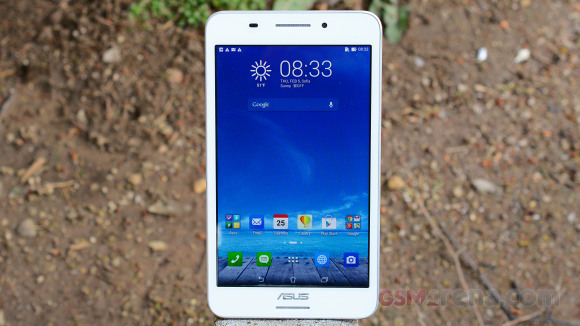 The Asus Fonepad FE375CXG churns out 720p videos at 30fps with stereo sound. They carry a bitrate of around 5Mbps and a lowly 96Kbps audio bitrate. Video recording carries over the same problems that we saw with the still images. The level of resolved detail is very poor as is the dynamic range - it looks to be upscaled from a lower resolution. Here's a 720p@30fps video sample (7MB, 10s) taken directly from the device. The Asus Fonepad 7 FE375CXG comes with the standard Android browser. It features largely the same functionality as Google's Chrome browser (also included), but tends to be a lot more choppy likely due to it being un-optimized for the new Atom processor inside. The Asus Fonepad 7 FE375CXG offers its own file managing app that allows you to easily manage your video, picture, and document files, although there is no document viewer/editor pre-installed. There are plenty for free in the Play Store though (even ones made by Google), so this shouldn't be a problem. There's a SuperNote app that aims to provide similar functionality as Samsung's S Memo app found its Galaxy Note series, except without the stylus support. It supports a wide range of templates and handwriting recognition that'll automatically separate your writing across lines. A handy Dictionary app is also on board, which can pronounce words and offers a direct link to the Wikipedia article on the word in question. The Fonepad 7 comes with an equalizer that is always enabled, and allows you to set various sound profiles depending on your usage scenario. Accessing the AudioWizard app lets you quickly set the sound mode using a popup with one of six presets. A ZenLink package of four apps provides added functionality. PC Link enables you to control the tablet from your computer, via an application you download from the Asus website. Once the application is installed and the two devices paired, a resizable mockup tablet window appears on your desktop and you can use your mouse to send commands to the tablet. Remote Link does just the opposite, turning your Fonepad 7 into a remote for your PC. Another desktop app needs to be installed and communication takes place over Bluetooth. The Share Link and Party Link apps are two additional options for quick and easy exchange of photos and what not. When it comes to getting around, the Fonepad 7 relies on Google Maps and Navigation. The app offers much of the same functionality as its web-based counterpart, although you will need a data connection to take full advantage of the navigation features. Street view mode with digital compass enabled is an especially neat thing that you should definitely check out if you haven't already. Whatever may be missing in the preinstalled apps, you'll find it in Google's Play Store. Dual SIM tablets? Now, that's where the Asus Fonepads are virtually unchallenged. Not by major brands anyway. Lenovo has a couple of entry-level offers and the rest are names most people haven't even heard about. There you go, it's a small niche but therefore vacant. The question is, of course, will people want a dual-SIM tablet in the first place. Our guess is, the Wi-Fi-only Nexus 7's have sold more units than the cellular version. And whoever bought the latter didn't do it for the calls - the Nexus line doesn't support them. Tablets that can take phone calls have their uses, at the very least you don't have to carry two devices if you're travelling. Wired or Bluetooth headphones is all it takes. Though honestly, we do think taking pictures with an iPad is a lot more embarrassing than holding a 7" tablet to your face. The second SIM card just adds some extra flexibility, letting you combine a plan for calls and one for data, or keep work and personal apart. And that's on top of the typical tablet stuff. Browsing the web, viewing images and documents, reading, playing games. The Fonepad 7's seven-inch HD screen is good enough for all of that. It actually is capable of great colors and contrast, but those are occasionally ruined by the highly reflective surface. The hardware is ...well... affordable: a mediocre processor with fast graphics. And the camera is just the abysmal 2MP fixed focus. The SD card slot means you can store tons of music and videos. These can be enjoyed on the stereo speakers or the tablet can be your wireless player, displaying content on compatible big screens. The Asus Fonepad 7 can connect to other devices as well: tablets, phones and computers. Priced at about €165, the Fonepad 7 FE375CXG is attractive enough even with all those rough edges. Sure you can do better, but you'll have to pay more - and most likely sacrifice the second SIM. Speaking of, Asus is shaping up as the brand of choice if you're after a tablet with a couple of SIM slots. The one we're reviewing has an alternative with a better camera and faster 1.83GHz processor. If imaging is important, the very recent Asus Fonepad 7 FE171CG (we know, those names are ridiculous) will offer an 8MP rear and 2MP front cameras. To stay within budget though, it only has an entry-level 600 x 1024 screen. There's even an eight-incher, the Fonepad 8, which has the same specs as our guest, with only a higher-res 5MP rear cam. The Lenovo IdeaTab A3000 is probably the only meaningful alternative with dual-SIM support. It's quite old though and KitKat is less than certain. You'll get a 5MP camera but only a WSVGA screen. The choice of single-SIM tablets capable of making calls is a lot bigger. Samsung's Galaxy Tabs have been supporting this for a few generations now. The latest Galaxy Tab 4 7.0 3G will charge double but the Tab 3 Lite 7.0 3G should be quite affordable. If money is of no issue, you may as well look at the Huawei MediaPad X1. The Asus Fonepad stands no chance obviously against an almost bezel-less Full HD screen, LTE and a 13MP camera with LED flash. A more down-to-earth option is obviously the Huawei MediaPad 7 Youth2. 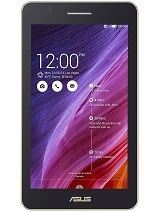 The Asus Fonepad 7 FE375CXG is by no means perfect but it's one of the more affordable compact tablets. The voice-call support is adding to its productivity and dual-SIM lets it get away with things a regular tablet would've found it hard to justify. Cheap and sensible, with a near unique feature. Asus could've done a lot worse.